I love baking and taking photos. So, this blog is all about baking and, of course, food photography. As requested I baked this for the Birthday cake. It is full of coffee flavour and very moist. Butter cream is tricky to make as it almost split.... but I just managed to hold it together to make a soft creamy texture. The key points for making perfect buttercream is NEVER use butter straight from the fridge. Be patient to make sure the butter is soft. It's also important to mix the icing sugar little by little. This apply to adding the coffee as well. Fat and water do not merge together unless you do this carefully. Anyway, this is a great cake for any occasion. It's one of my favourites. In a bowl, beat the butter and sugar together until very light and pale. Add the eggs one at a time to the butter and sugar mixture, beating well to completely incorporate each egg before adding the next egg. Add the espresso to the mixture and stir well. Add the flour and chopped walnuts and stir well to completely combine. Spoon the cake mixture into two lined and greased 20cm/8in cake tins. Transfer to the oven to bake 25-30 minutes, or until a skewer inserted into the centre of the cake comes out clean and the cake is golden-brown. Remove the cakes from the oven and leave to cool on a wire rack. For the buttercream topping, beat the butter and icing sugar together in a small bowl until pale and light. Add the espresso and mix well. Spread the buttercream over the top of each cake, then place one cake on top of the other. 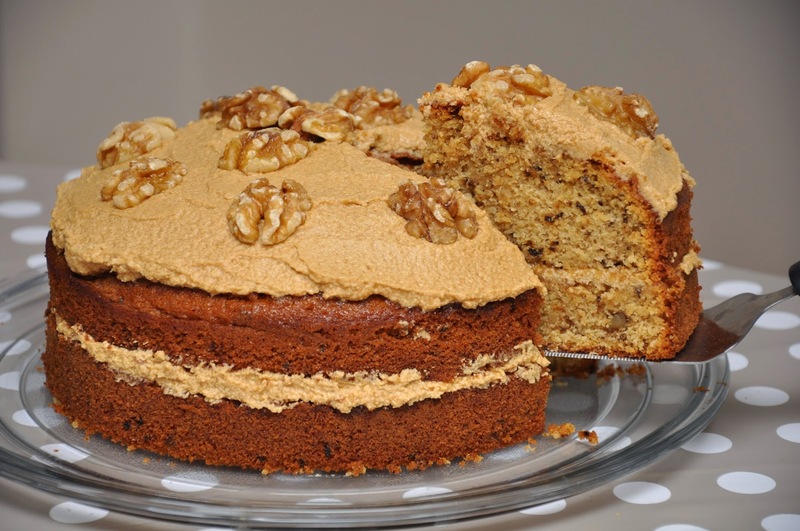 Decorate the top of the cake with the walnut halves and serve in generous slices. Just like mayonnaise and hollandaise sauce, buttercream is an emulsion of fat and liquid that can break into its component ingredients if not handled properly. You'll know when it happens because your buttercream will suddenly look like cottage cheese. Cream together the butter/margarine until it turns light and fluffy. Beat in the icing sugar powder gradually. Keep beating until the resulting mixture becomes smooth. Add the coffee liquid. Only add small amounts until the icing becomes of a spreadable consistency. It is always better to add less than too much. For the busy baker, you can use instant coffee instead. That's what I normally do anyway. My Images Do Not Belong To The Public Domain. All images are copyright © Kyoko Beaumont. All The M. Picture Window theme. Powered by Blogger.